The competition attracted 85 submissions from 17 countries, with entries coming from equestrian enthusiasts, athletes and designers aged between 15 and 74 years old. The winning entry by Peder Fredricson, who successfully combines his careers as a Swedish Olympic Jumping rider and graphic designer, was selected from an anonymous shortlist by a panel chaired by FEI President Princess Haya. The panel members also included Kevin Staut, one of France’s most successful jumping riders and the first Athlete Representative on the FEI Executive Board, Lambis Nikolaou, Chairman of the IOC Culture and Education Commission, and international graphic design specialists. “As a rider, I know how the pictograms should appear, the correct proportions, the connection and the movement. I’m really happy to have done this and I’m proud that my designs were chosen,” Fredricson said. Fredricson started out in Eventing, winning two gold medals as a junior at the 1989 European Championships and finishing 14th in the 1992 Olympics. Since 2000, he has focused on jumping, and in 2004 he made his Olympic début in Athens where he finished fourth in the individual competition and played an essential role in securing the Swedish team’s silver medal. Princess Haya said the submissions for the online design competition were overwhelming, and demonstrated perfectly just how wide the interest and participation in equestrian sport is currently. 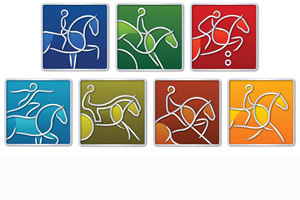 “We are delighted that the winning design concept that inspired our new pictograms was created by a member of the equestrian community. “Peder Fredricson worked closely with us to further develop the fresh, new discipline icons which will now become an integral part of our identity, and which we hope will help our ever-increasing international audience to recognise each of our seven disciplines instantly,” she said. Peder Fredricson received a prize package including two VIP tickets to a top local FEI event, the latest iPad and an annual subscription to FEI TV, the FEI’s official video channel.